Some home improvement projects need a table saw, nothing less. Manual circular saws, miter saws, hand saws, and reciprocating saws have their place and can produce an amazingly wide variety of cuts. But when it comes to making a rip cut in wood, a table saw is the only way to do it so accurately and to produce cuts that look like factory edges. Rip cut is a term that refers to cutting a long board lengthwise. For example, when building a door or window frame, you may need to shave off a half-inch from the length of the board. Or you might have a sheet of plywood that needs to be cut lengthwise for flooring subfloor. 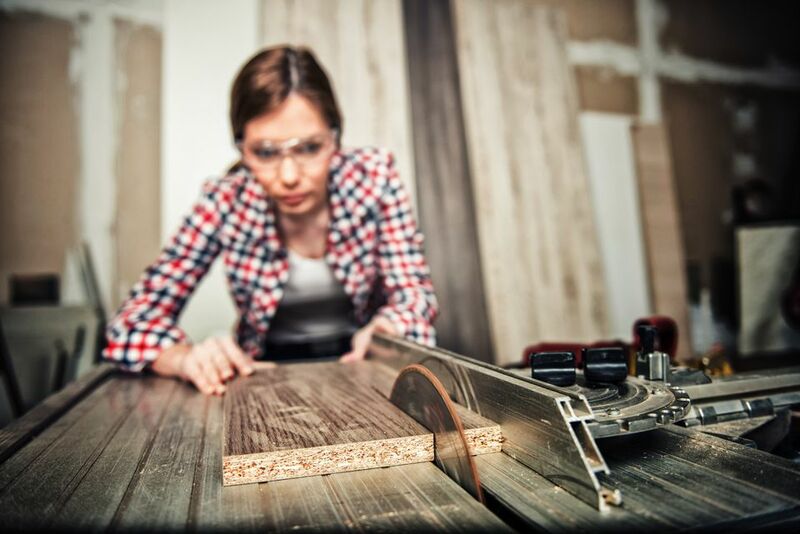 More difficult are thicker boards, such as two-by-eights or two-by-tens, that may seize up when you try to rip them with a hand circular saw. Balky cuts mean ragged lines, and the work product is barely worth saving. Use a push stick, an expendable stick of wood about a foot long and a one-by-one square. With this push stick, you can force the board through that last foot or so. The push stick will go where you don't want your hands to go. Avoid table saw kickback, a dangerous condition that injures many users of table saws. Kickback shoots the wood back at you at a high speed. Make sure that the wood is pressed firmly against the gate and that it travels slow and parallel to the gate. Watch out for wet wood and for knots in the wood. Keep the table saw unplugged except when you are cutting wood. Always use safety glasses and hearing protection. Avoid using gloves, as gloves can sometimes get caught in the wood stock or in the saw, drawing your hand into the blade. Alternatively, you can draw a mark lengthwise, down the entire board. With this, you can be confident that the table saw is accurately following the cut line. Set the marked end of the board on the top of the table saw. Adjust the wood so that the teeth of the saw are touching your pencil mark. Then, move the wood slightly left so that you will not be cutting exactly on the mark. Table saws chew up so much wood that they will throw off your measurement by at least 1/8-inch if you do not preserve the mark. Make sure that the gate is snug against the side of your wood and then snap the gate back into place tightly. If the table saw is set into an actual table, skip this step. The table will keep the majority of the wood stock in balance as you feed the wood into the table saw. But if you are like most homeowners and have a stand-alone table saw, you need to have a surface on both sides of the table saw that is level with the top of the saw. This is less critical if you are cutting a short board. But for longer boards, the board will tip back and forth as you feed it through. You can create a makeshift surface made out of stacked up blocks of wood with plywood on top. With your push stick nearby and your safety glasses and hearing protection on, make sure that the saw's safety guard is down. Flip on the power switch. Push the wood through at a slow but steady rate, pressing it lightly against the gate. If you slow down or stop, you will notch big grooves out of your wood, destroying your straight line. You must keep the wood moving. When the wood is about halfway through, pay attention to the wood coming out of the saw along with the wood on the feed end. As you approach the end of your cut, your hands will get closer to the saw blade. Pick up the push stick and use it to push the wood stock the rest of the way through the table saw. Be careful that the push stick does not slip off of the wood stock, causing your hands to fall into the blade. Before you retrieve your rip-cut wood, turn off the power on the table saw. If you do not expect to be making another cut, unplug the saw.